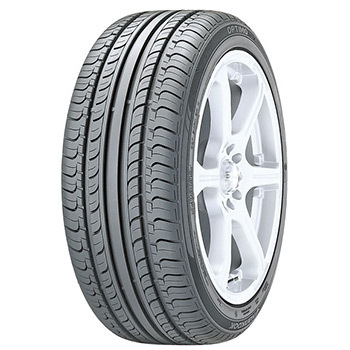 Hankook Optimo K415 is a smooth mass segment tyre meant for hatchbacks and mid-size sedans in the country. It is destined to get along well under challenging Indian road conditions with its determined performance. It maintains a perfect balance of superior traction and enhanced braking. The Optimo K415 also enables a smooth handling and efficient control alongside brings down the fuel consumption. A comfortable ride is enjoyed along with lower levels of noise every time. The tyre receives the highest number of performance ratings by Hankook in the wet, noise, comfort and wear department. The innovative tread pattern of the tyre resists aquaplaning and offers an excellent wet traction. It has been engineered with the HSG technology and receives an exclusively designed pattern which ensures utmost safety and reliability under high speed conditions. The Optimo K415 is a contemporary hard wearing tyre that is made to last long. Hankook Optimo K415 comes with a wide centre rib that delivers greater handling and shorter braking distance. It has been designed with lateral shoulder grooves that enhance handling in dry conditions and ensure surefooted grip under in rainy setup. The four-channel water dispersal system of Optimo K415 maintains safety on wet roads by allowing rapid expulsion of water. It is equipped with a shoulder rib block which minimizes vibrations and cabin noise alongside enhances high-speed handling. The wide and high-tensile steel belts used in the construction of Optimo K415 and reinforced tread compound ensure a more precise steering response and prevent its wear rate. The jointless cap ply within the tyre’s structure enhances its uniformity so as to give a smooth ride and greater durability. The use of unique and durable compound makes Hankook Optimo K415 ideal for highway and city use.